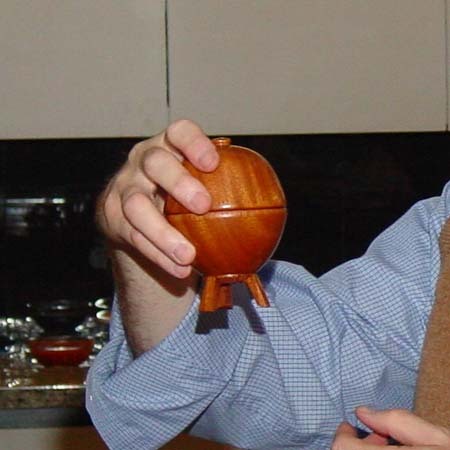 The first meeting of 2007 will be our own member, Sam Turner who says, “I think I told Joe Levy that I would be talking about finishing tricks. Unfortunately there aren’t many tricks so I guess that’s a misnomer. 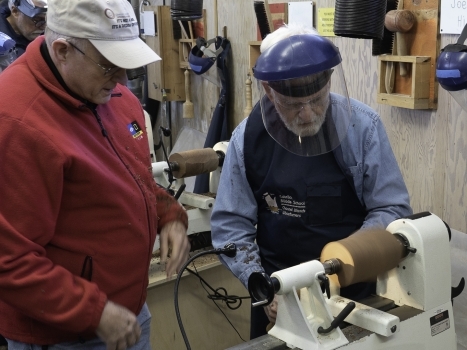 However, the answer to finishing woodturning projects is to know and understand what’s available, whether it’s appropriate for the intended use of the piece, how much time you want to spend on it, how to apply it and smooth it out if necessary. Other decorative considerations also come into play here, such as clear finish vs. paint. 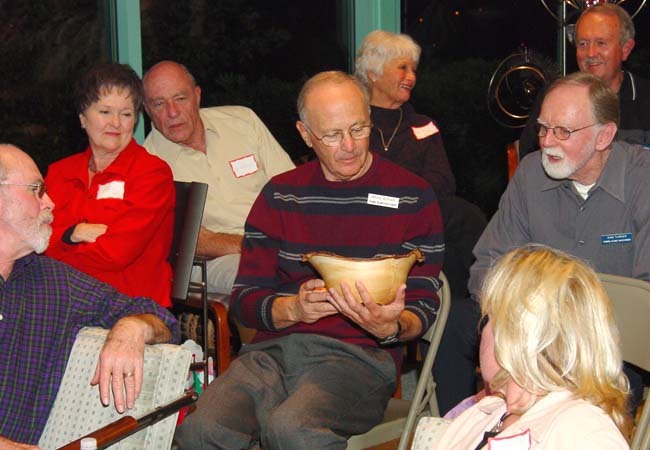 We will have our usual Show-N-Tell session so bring something to show particularly if it has an unusual finish that you can describe as part of our discussion. 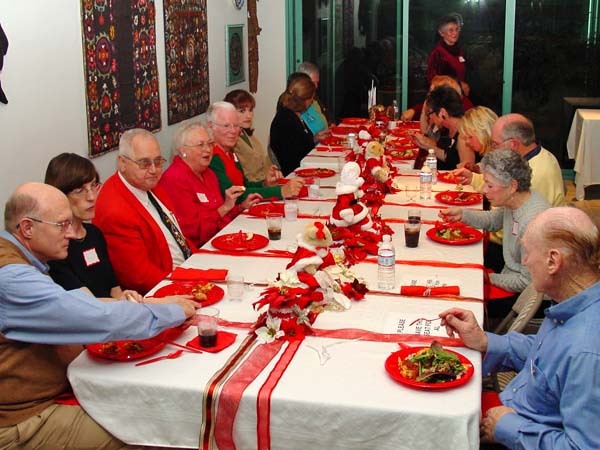 Our December activity was the Holliday Party on Dec. 9th at Lynn and Al Geller’s home. This is the 4th year that they have hosted the party and again it was a lot of fun. 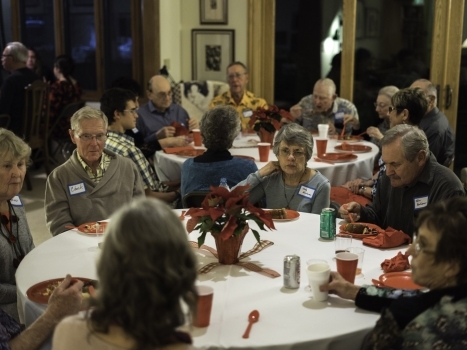 Thanks also to Barbara Turner for making all of the phone calls and potluck arrangements again this year while the Geller’s were on vacation. 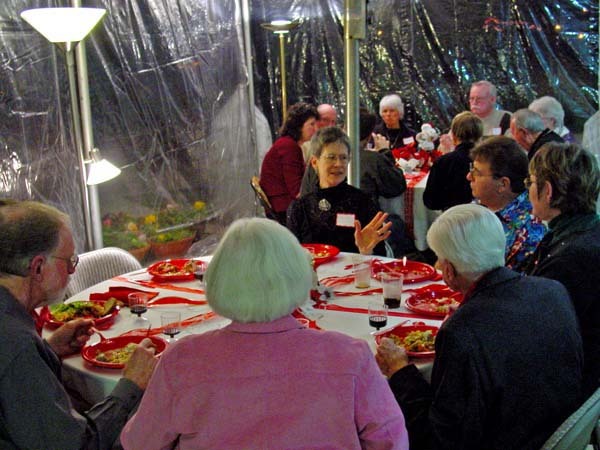 Because our club has grown to over 70 members we expected to have more than the usual 50 or so members and spouses as guests so Al arranged to rent a tent to set up on his patio. The tent, with its plastic sides and heaters worked wonderfully and added considerable more room for us to all sit down and eat at the same time. 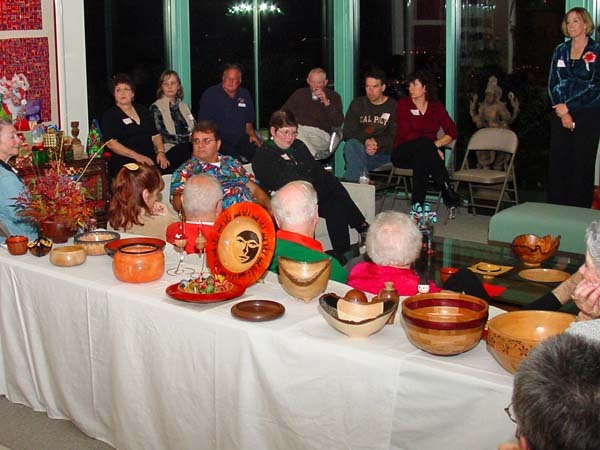 Unfortunately, not many of our new members and their spouses were able to attend and missed out on an evening of merriment, sharing of exciting woodturnings and a chance to meet the members and spouses. Hopefully when we have our July 7th potluck picnic they will be able to attend [this is an early invitation so you will have no excuse: put it on your calendar NOW]. After eating, President Martha Etchart turned the meeting over to David Frank, your current newsletter editor and webmaster. We held a movement of silence for the two members who died this year: Michael Lindsay who had been a member for just over a year and knew he was ill when he joined; and Lester “Les” Merchant who had been a long time member but was unable to be active in the past several years. 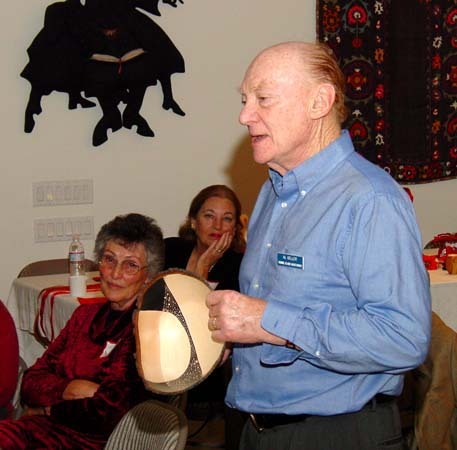 Les was in his 90’s with a background in production furniture making, metal work (he made much of his production machinery), was a master carver and an excellent woodturner with an artistic bent for making exquisite turnings on a small homemade lathe. Both men will be missed for their contributions to the club. David then had the pleasure of surprising Russ Babbitt Jr. by recognizing and honoring him for his importance in the organization and maintenance of the club. 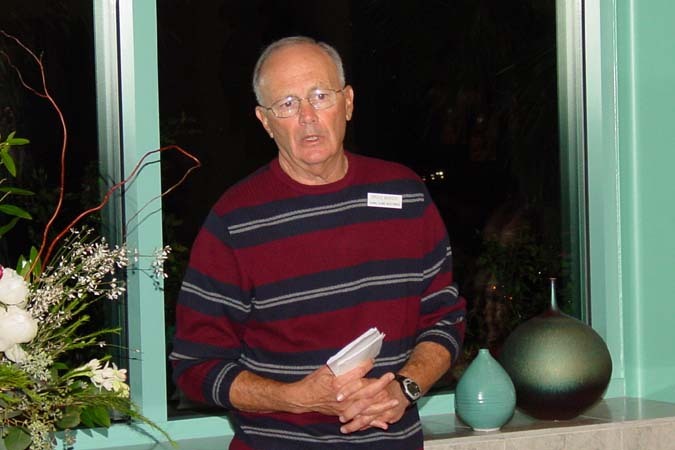 Russ is one of the few charter members who started the club in 1996 who are still active. Ron Lindsay may be the only other one. Russ just happened to bring samples of the first two year’s newsletters along. 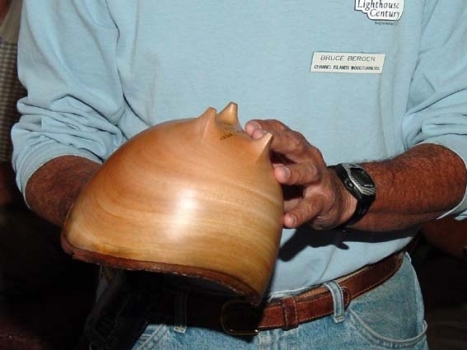 The first year the club had no name, the second year it was recognized by the AAW as the Ojai Woodturners’ Guild. 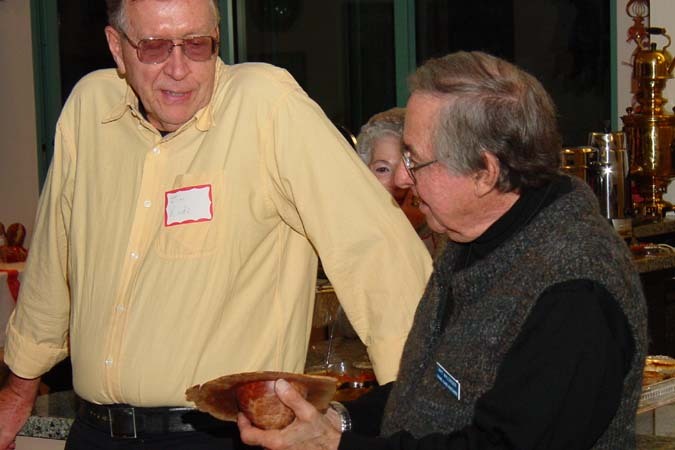 Russ served as the newsletter editor for the first 5 years, and along the way when we became the Channel Islands Woodturners in 1997 and stopped meeting in Ojai, was president, vice-president, treasurer, program chair and librarian, often all at the same time. 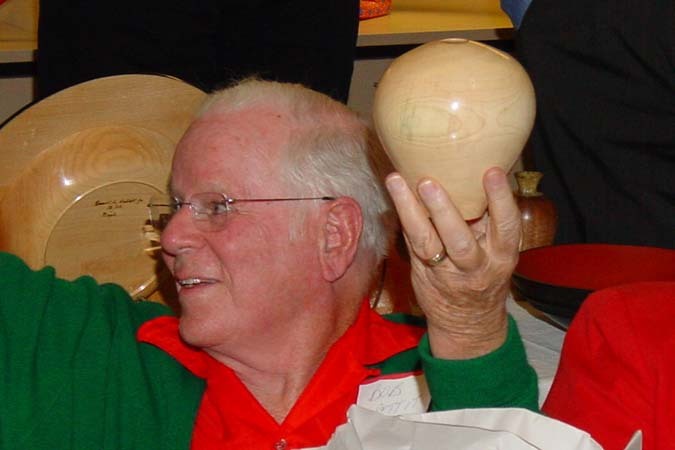 The club had only about 10 members until 1997 when Hugh Frank moved to Camarillo and by joining both the Woodturners and the Woodcarvers subverted many of our current members to put away their hand chisels and take up woodturning. Recently Russ has served as Librarian [that means he gets to pick the videos he wants to watch and buy them for the club] and videographer for the professional demonstrators we host. 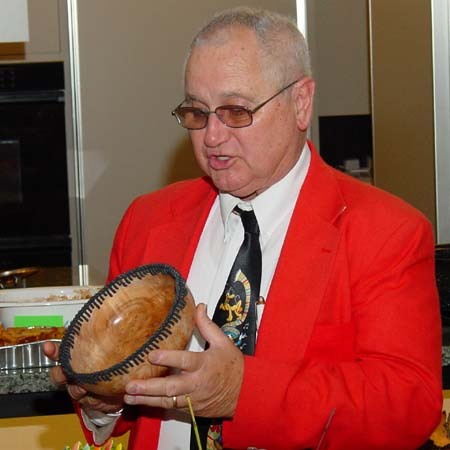 This past year he as been particularly active in many roles helping to coordinate our participation at the fair, keeping members aware of the demonstrations available at neighboring clubs, and hosting the Hands-On-Sessions at his home including cooking the BBQ lunches. In sum, Russ has been the glue that has held the club together during the lean years and is still there when we need him now that we have over 75 members. As a special thanks to Russ, a few covert operatives decided that a gift of wood (he has all he needs) or a gift certificate for a tool catalog (Russ already has everything) would never do to properly recognize his major contributions to the club. Therefore approximately five of us (Russ can blame Jim Rinde for the idea) turned a special piece to give to Russ and we presented them to him at the party. Photos of some of these are below with the party photos. More members would have gladly participated if they had known but secrets are hard to keep so we didn’t get the word spread very well. 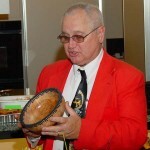 Thank you Russ for all you have done for woodturning in Ventura County. Our incoming president, Bruce Berger presented Martha with a gift certificate to help her buy the new small lathe she wants, and then presented the new officers for next year (see Officers). 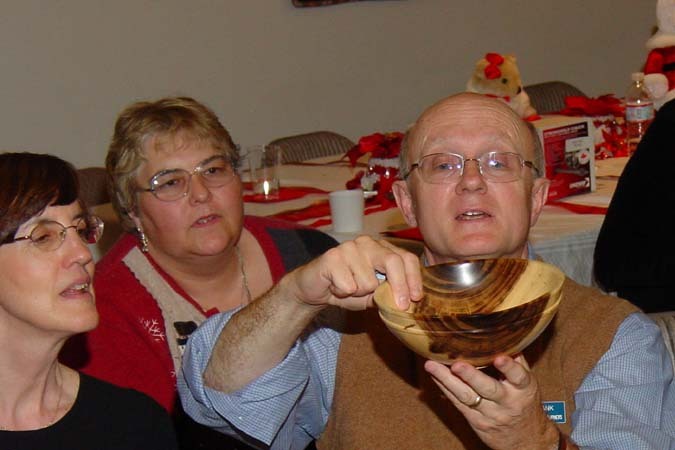 Given the history above, 2007 is the tenth anniversary year for the Channel Islands Woodturners. We are making several changes including better video screens for the demonstrations, and a new location for the Hands-On-Sessions. These will likely be at the Wood Shop at the Oxnard Community College after a few final details are worked out. We are thankful to Levi Mize for allowing us to continue to hold our regular meetings and all day demonstration at his Shop. 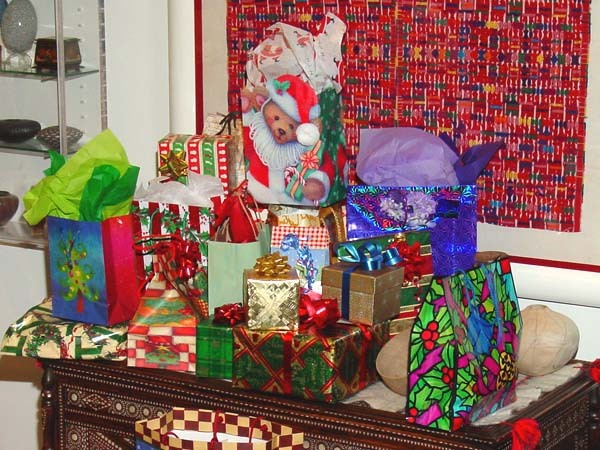 While all of the above has taken several paragraphs to describe it only took a few minutes and we spent the bulk of the evening opening the exchange gifts of turnings and the raffle of the pieces left for us by the professional demonstrators we hosted this year. On a personal note this begins my 7th year as newsletter editor and 4th year as webmaster. Many of you have helped with the writing and special thanks go to Ron Lindsay for providing and editing photos. I have had great fun being editor and learned new skills as webmaster, but after this year it is time for someone else (or two) to take over. You have a year to ferret out from our talented and much expanded club people with the right skills or willing to learn them. Exchange gift packages waitng to be opened. One of the inside dinner tables. 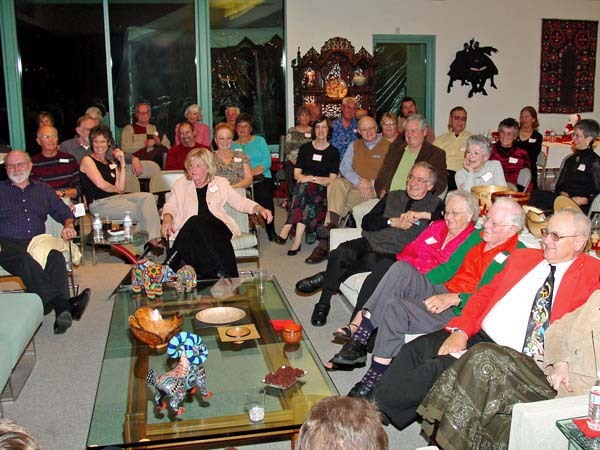 Host Al Geller at front right. Dinner tables in the warm and cozy tent. A wide range of pieces on the Show-N-Tell table. With dinner finished, gathered for the festivities. Sam’s special gift to Russ. Russ had exploded a bowl and discarded the pieces. Sam reasembled them with wire spacers and used Milk Paint to highlight the segments. Jim givng Russ a very special hollow-form with an epoxy neck (the first 2 attempts blew up). New President Bruce Berger describing plans for next year. Four turnings from our demonstrators for the raffle. Russ with his gift exchange from Bob Pettit. 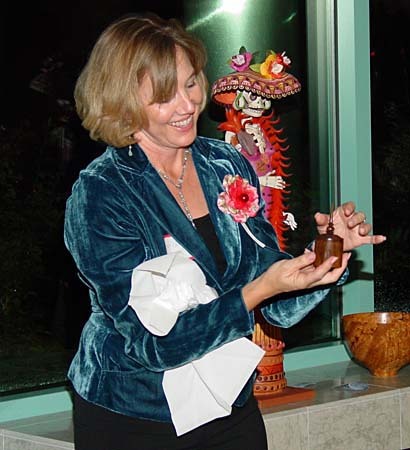 President Martha opening the threaded-top box from Russ. 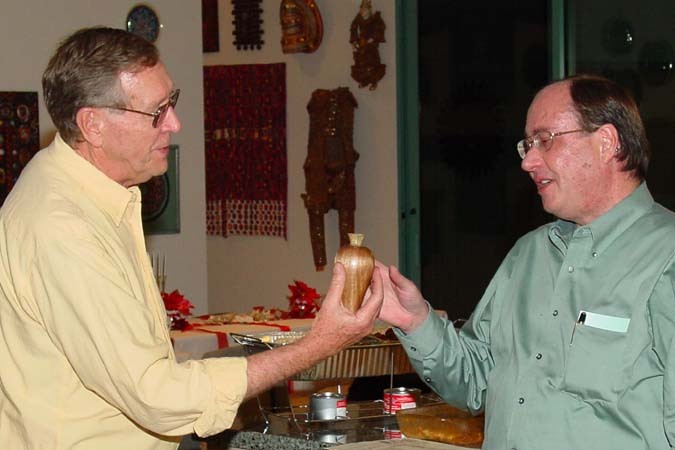 Bob Pettit holdding his gift from new member Chuck Lubin. Chuck is an accomplished turner but new to hollow-forms. 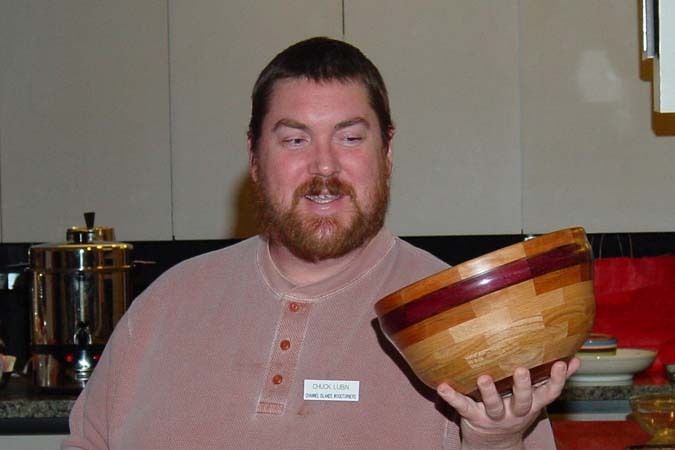 David holding the exquisite acacia bowl from Jim Rinde. 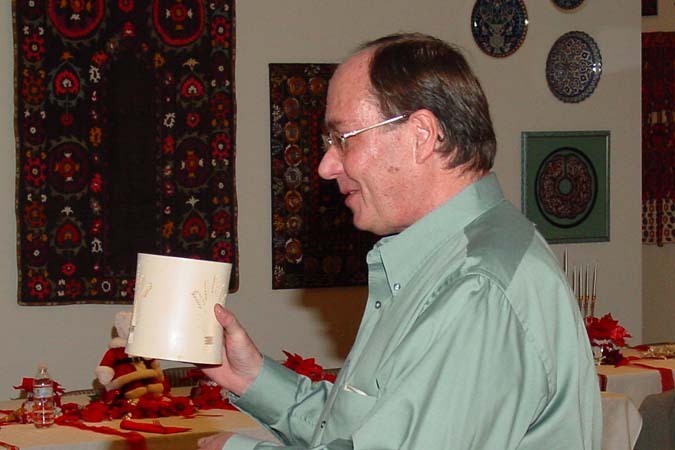 Bruce with his gift of a very thin wet turned bowl from Al Geller. 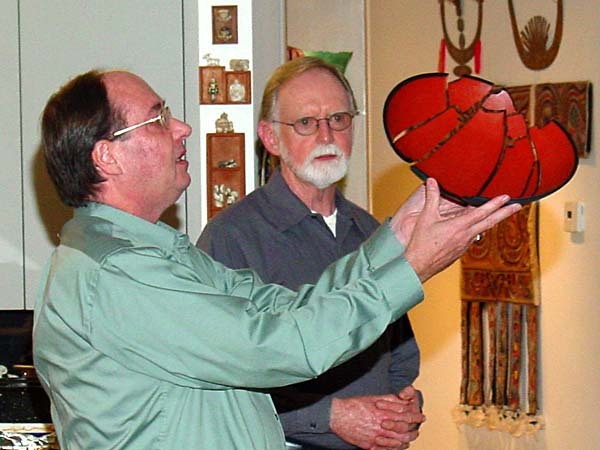 Jim admiring Art’s raffle prize made by Stuart Batty. Al with his Show-N-Tell piece. Another exploded bowl that he reassembled and hid the edges with gesso and design painting. David with his Show-N-Tell and special gift to Russ. Its a box, but is it an egg with legs or the “Mother Ship”. New member Chuck Lubin is from Arizona. 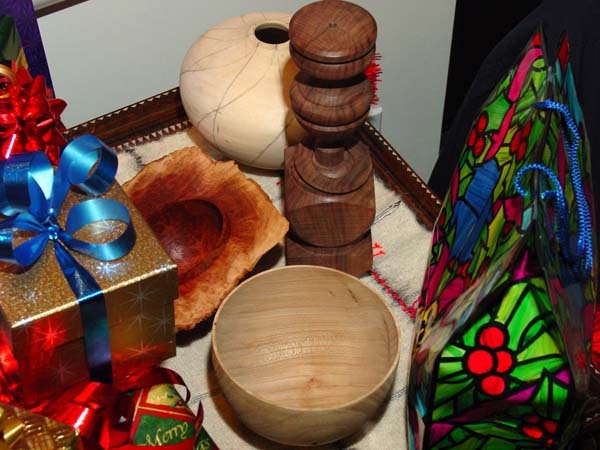 Large pieces of wood are hard to find so they do a lot of segmental turning. 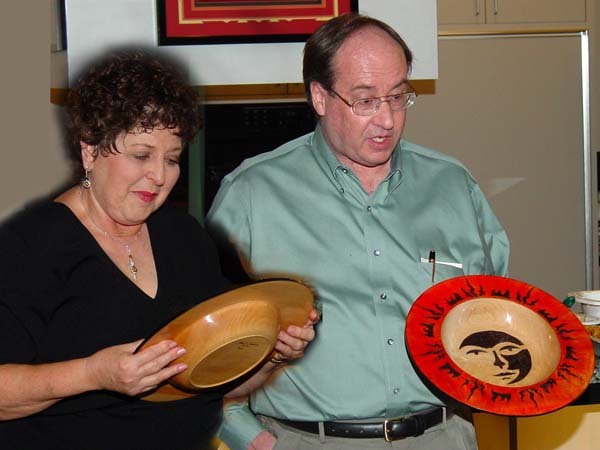 Composite photo: Hostess Lynn Geller admiring Russ Babbitt’s “Face” platter.